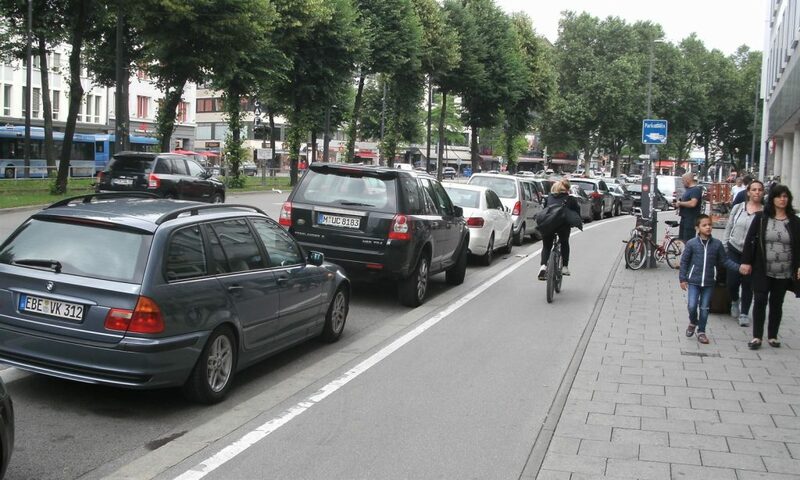 One of the truisms about cycling in the world is that invariably it is a lot harder for “large” cities (say, greater than 1 million inhabitants) to get a lot of people cycling. 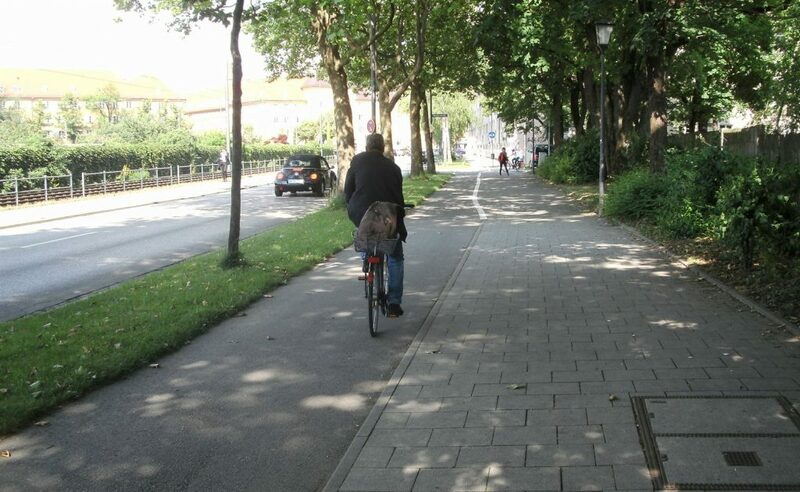 Smaller cities are more likely to have a compact size enabling more biking trips; they may also have a greater proportion of people at institutions such as major universities that tend to see more cycling (as we find in Groningen, NL, Oxford, UK, and Davis, CA). With the exception of Chinese places like Beijing, and of course the Amsterdams and Copenhagens of the world, it is very rare for large cities to see more trips to work (and elsewhere) made by cycling compared with even Christchurch. For all the news attention that places like London, New York and Paris get for their cycle-friendly initiatives, none of them currently has more than 3% of trips by bike. One very notable exception is the German city of Munich. 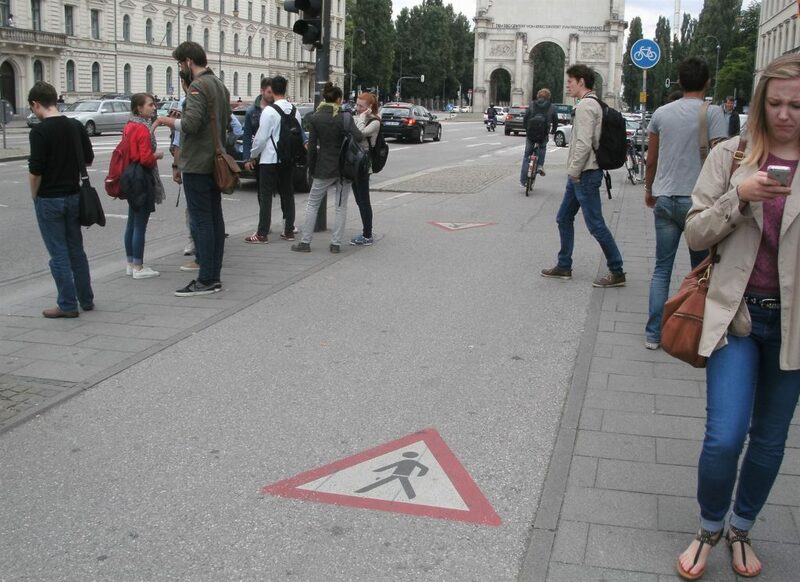 Munich has about 1.5 million people, although the surrounding urban area has about double that number. 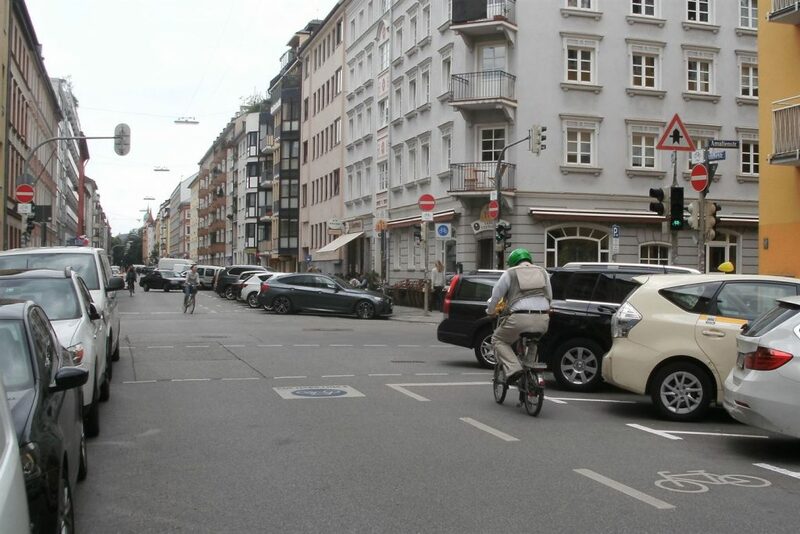 Despite that, Munich manages to get a very impressive 17% of its inhabitants cycling to work (with good walking and public transport as well, only 37% drive to work). 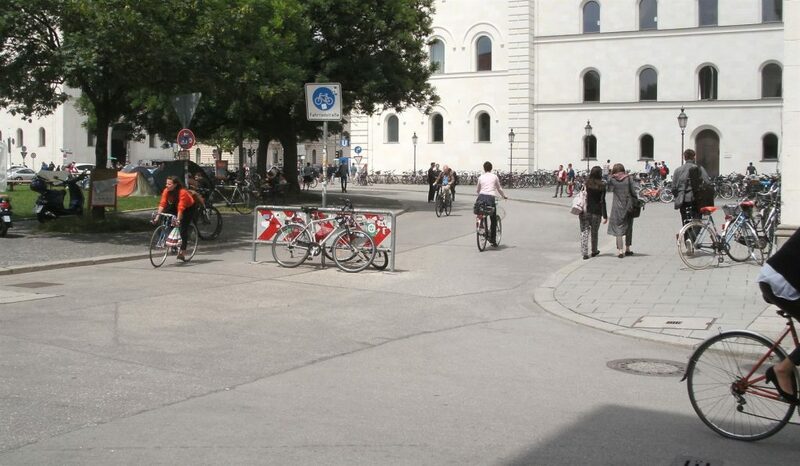 Not surprisingly, Munich bills itself as the Germany’s Radlhauptstadt or “cycling capital” (which might be true for large cities, but still pales in comparison to the likes of Münster we saw previously). 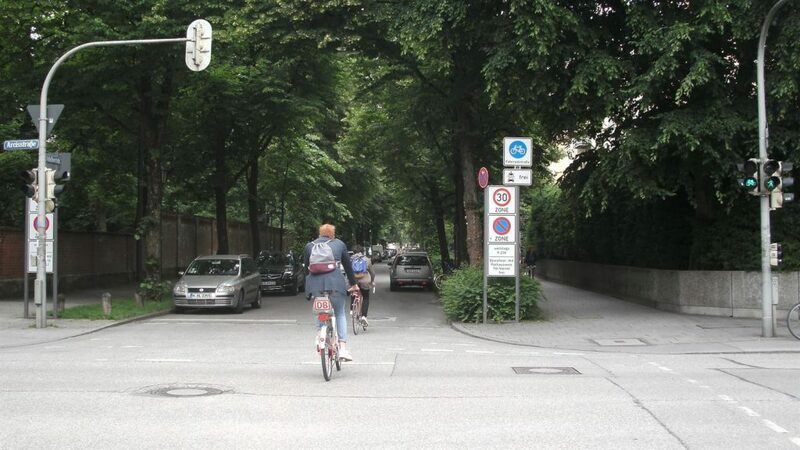 Munich has a network of over 1200km of cycle-friendly routes (more than half of the total street network). 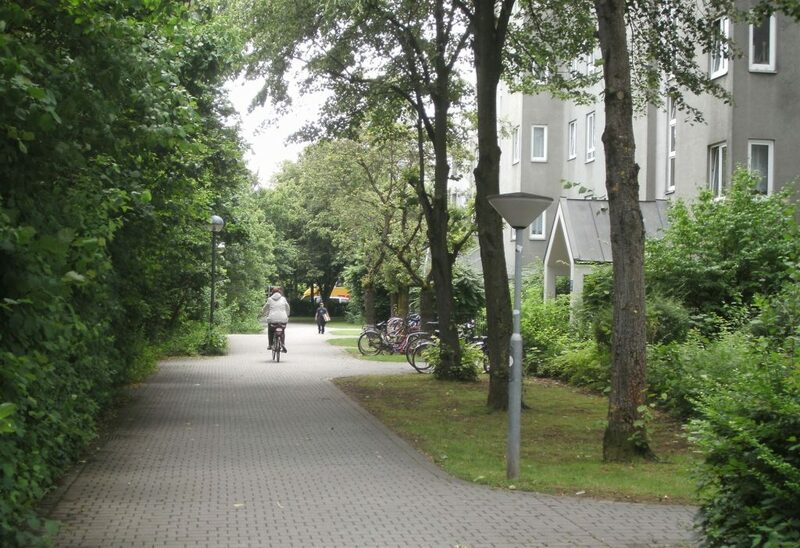 Many of the formal cycleways are separated paths, typically adjacent to the footpath; often there’s not much distinction between them (on my last visit here, I was forever dragging my family off the cycleways that they had inadvertently wandered onto). 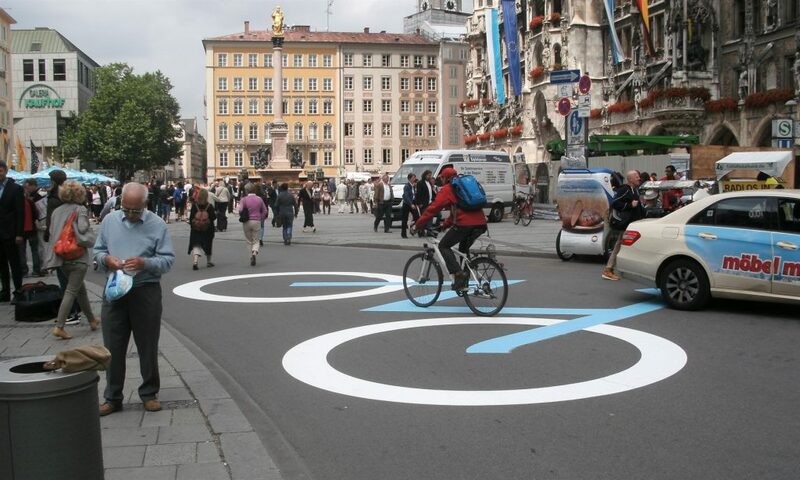 There are painted cycle lanes in places too, but not as prevalent. 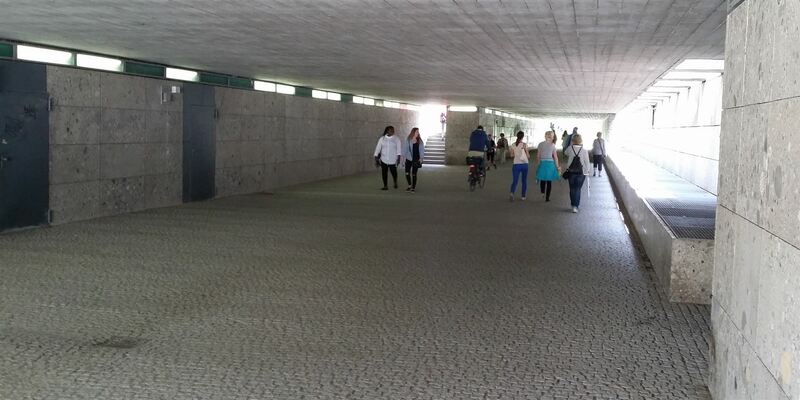 At times, the maintenance and quality of the facilities provided left a bit to be desired (a few of the paths are in particularly tight spots between traffic and pedestrians). 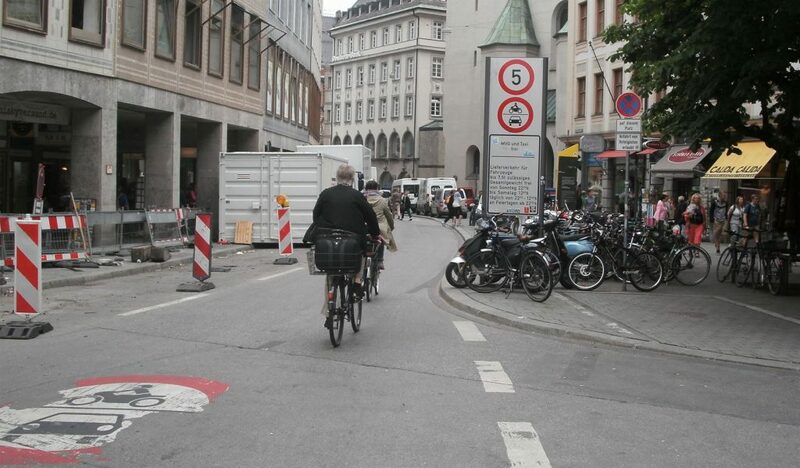 But in the main, people just accepted this and biked anyway. 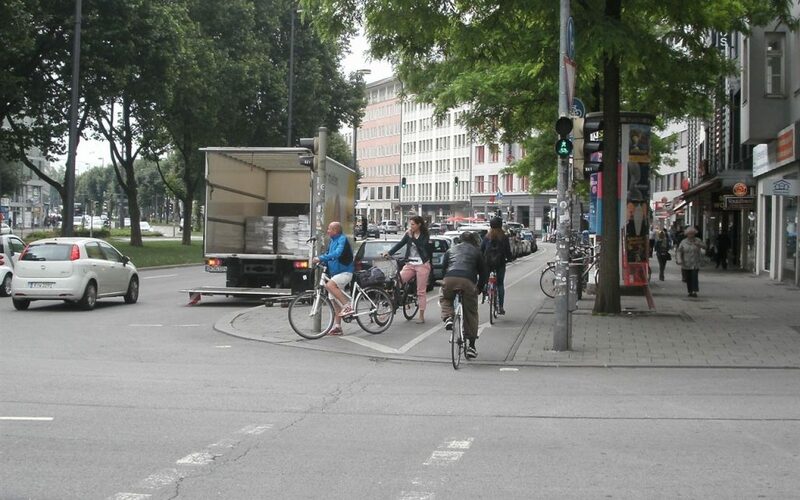 Near the city centre, as we have seen in other European towns, it becomes harder for people to drive through, thus freeing it up for easier biking and walking. 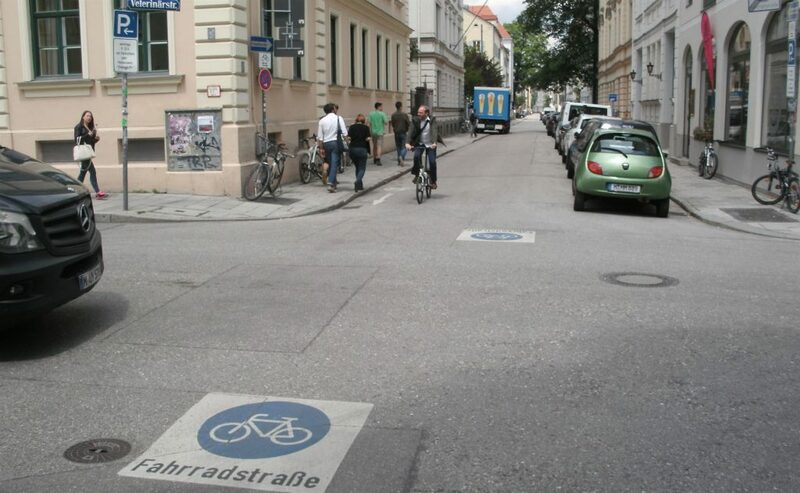 Munich has embraced the use of fahrradstrassen (“bicycle streets”) as a simple way to discourage motor traffic, e.g. by making them one-way when driving and with 30km/h speed limits. 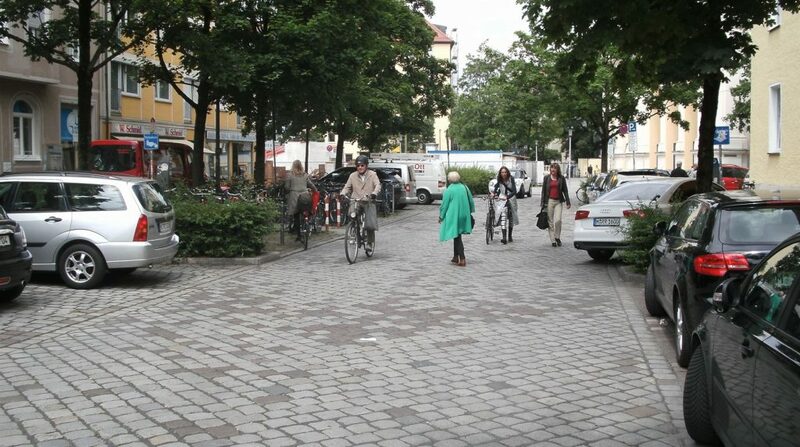 Cyclists know that these will be friendly routes for riding along, even without formal cycle facilities. 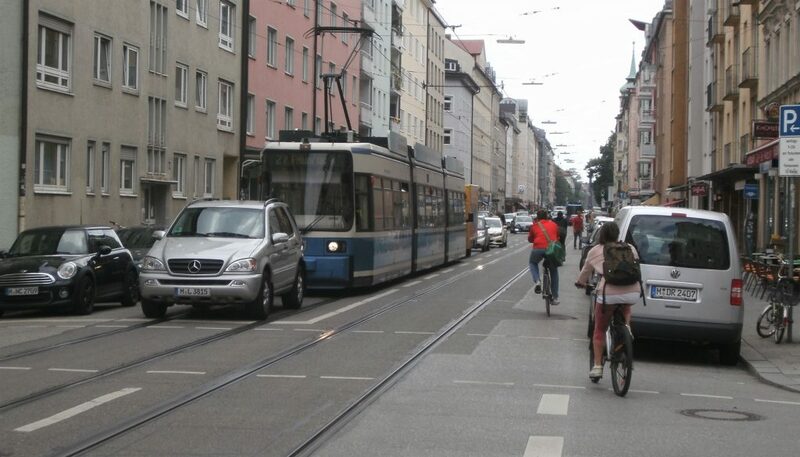 One notable feature about Munich’s network is that much of it has been developed relatively inexpensively. Want a contra-flow bike route? Put in a few signs and markings. Want to prohibit motorists? Put a simple railing barrier in the middle of the street. 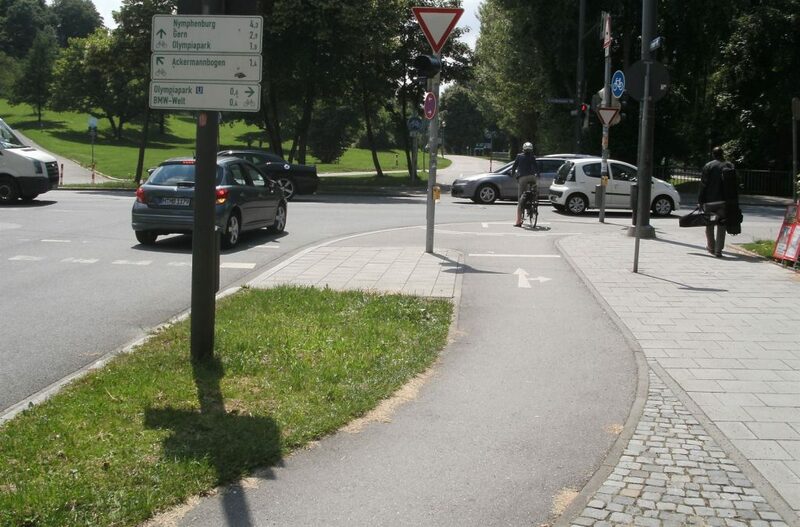 This has enabled Munich to roll out a lot of new cycle routes relatively quickly in recent years. 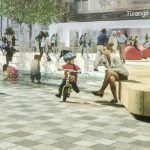 It’s not just the central city area that has done cycling well; many newer suburban areas have been planned to make walking and cycling an easy option to shops, schools, train stations, etc. 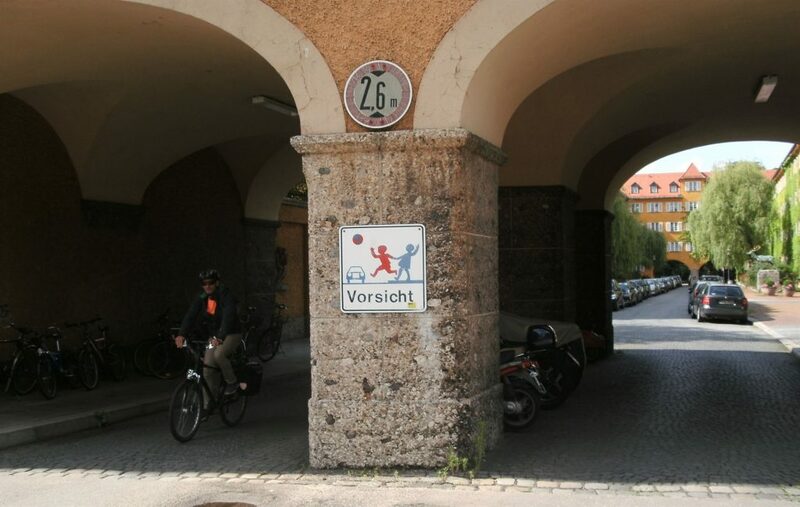 The area where I was staying (Neuperlach) is a case in point. As well as the ubiquitous 30km/h residential speed limits, pathways (with underpasses/bridges crossing busy roads) connect apartments to these destinations at least as easily as driving (and usually easier). 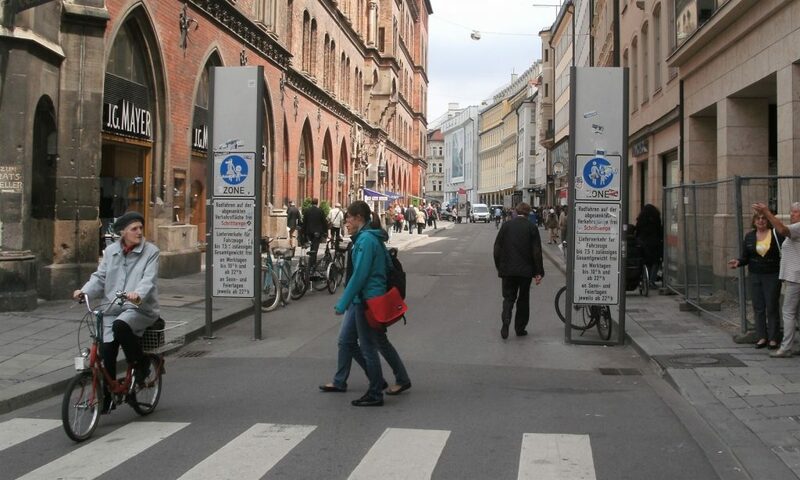 A big city needs lots of guidance to help people find their way around; fortunately there is a fairly extensive cycle route signage everywhere. 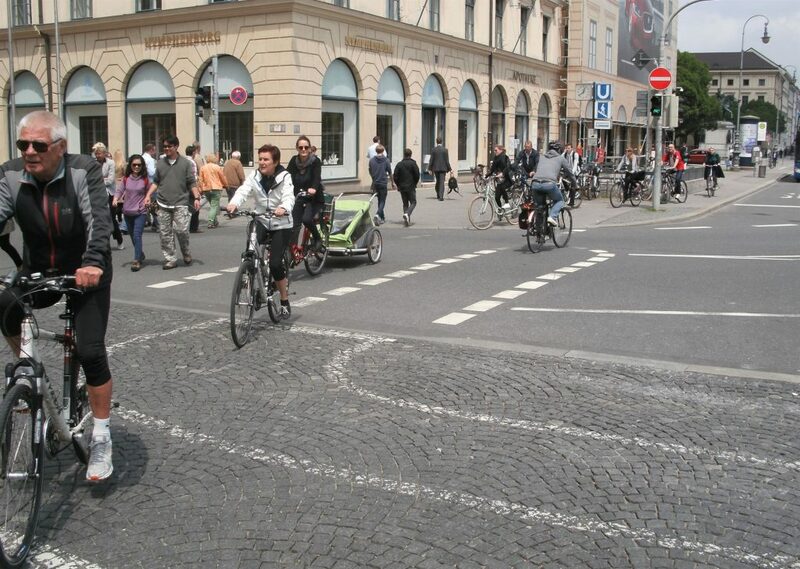 There’s a lot to see when it comes to cycling in Munich; they have had to put in a lot of effort to provide a fairly comprehensive network in such a large city. It’s by no means perfect in its execution and ongoing maintenance, but the cycling numbers achieved speak for themselves. 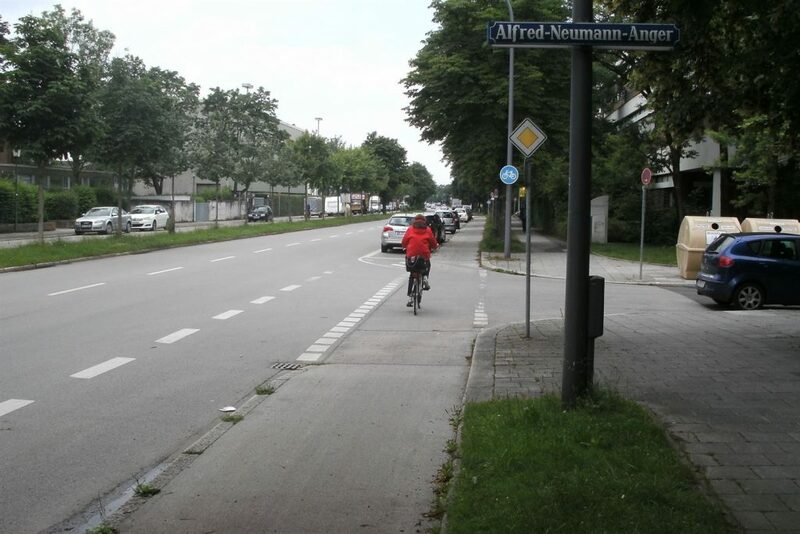 I’ll look at Munich further in another post when I zero in on how one outlying suburb has been planned to make cycling (and walking and rail) easier. Can a place like Christchurch replicate what Munich has done?